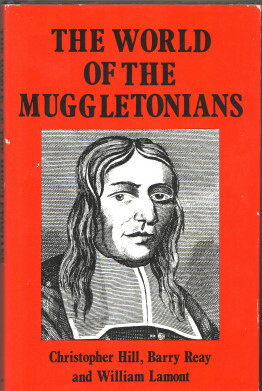 This book marked an important watershed in the study of Muggletonianism, with this book the study of Muggletonianism became respectable (well almost). This book is really the combination of three separate articles with some extra material added, and as such it does not really hang together as a single flowing study of the subject. What it does manage to be is to be an exhilarating tour of the early days and world of the Muggletonians. Lodowick Muggleton and "Immediate Notice"
What this book lacks in focus it makes up for in being both a good read and putting Muggletonianism in its proper historical context. I was chatting to an antique dealer a last year who showed visibly excitement when I asked about an item with Muggletonian implications, he explained that ever since reading this book at university he had been interested in Muggletonianism. My experience was similar, after reading this book at university I never lost my interest in the subject. this book is the granddaddy of Modern Muggletonianism study and has only recently been surpassed by William Lamont's excellent "Last Witnesses". It may have been surpassed but it is still essential. Chapter 4 consisted of an updated and expanded chapter appearing three years previously as part of the work "Prophecy & Millenarianism - Essays in Honour of Marjorie Reeves"